Welcome to the century of swiping right. When virtual world has taken over the dating game, it has become quite difficult to fathom if we have found ‘the one’ or not. Gone are the days when you could feel butterflies in your stomach at the mere presence of the person you desired. Convenience has taken over our lives and the essence of being physically present with each other has faded. Who doesn’t want to be in love? But to know if we have found the person we have been waiting for our entire lifetime out of the 7.7 billion people is this world is, well, a tricky job. Often times we feel that we have finally met the right person but ultimately we fall out and things don’t really work out. You see him and you feel your palpitating heart in your mouth. Your hand accidentally, brushes against hers and you keep thinking about it in a loop. We all know how it feels to be in love. But do we realise whether this person we are madly in love with is the right person for us or not? Is it the trick of the raging hormones or is it a genuine connection? 1. You’ll no longer be afraid to talk about your personal struggles. Our personal struggles are an intimate part of us. We are very protective of it and often feel vulnerable to share them with anyone. What used to seem difficult and embarrassing to share, will become easy and natural when you’re with the right person. You will have a feeling that you can be your true self before them for they will not condemn you for anything you have experienced in the past. Not only do they understand your struggles but also respect the person you have emerged out to be. You don’t need to talk all the time to enjoy each other’s company. Certain actions in silence can speak volumes. With the right person, the silence in between chats will never feel awkward. Their mere presence makes you feel comfortable and soothes you. 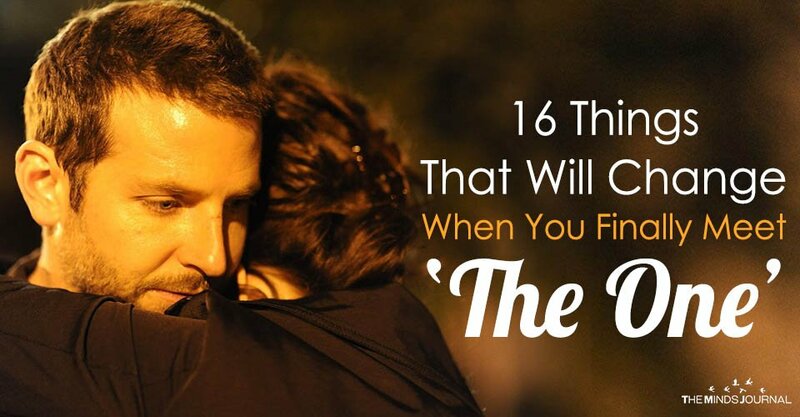 When you finally meet the one, you will forget about obsessing over what your partner exactly feels for you. The right person, who really cares for you, will have to make no efforts to make you feel wanted and loved. Their everyday behavior towards you will reflect that you are genuinely valued. You will never have to doubt their feelings for you. The thought process of two individuals may vary. You might often disagree about things but this will rarely end in arguments and conflict if the person is mature enough to exchange ideas rather than argue. You will respect each other’s point of view and lend an empathetic ear to the perspectives of each other. 5. You desire each other even when there’s no obvious reason for it. Your sudden urge to hold the other person in an embrace will no longer depend on how good your partner smells. Superfluous attraction will give way to loving the inside of the person and loving every bit of them, their flaws and virtues both. A mere look into the eyes of the person will light up even the darkest of your days. 6. You won’t be afraid to reveal your weird habits to them. You not only admit your strange habits to each other and accept them without botheration but even begin to partake in them yourself. You will no longer find their mannerism and behaviors odd. Rather you will find them adorable. 7. You’ll feel free to introduce them to your friends. When you are with the right person, what you feel for each other becomes your priority and you do not feel apprehensive about introducing them to your friends. Other people’s opinion about them does not influence you. You are delighted to be with them and that is all that matters. The best people always attract the best company. You don’t have to force a smile or struggle through a social gathering with your partner’s friends. Instead, you genuinely enjoy spending time in their presence. You feel you are at one with your partner and their friends become your close mates too. You can Netflix and chill together or can spend the whole day lazing around at home and just do nothing at all yet feel exhilarated. You don’t necessarily need to be doing something exciting or unusual to have fun together. The mere fact that you are in the other person’s presence soothes you. The idea of “The One” is erroneous..